While most people may not be inclined to refer to any insect as being intelligent, some advanced termite species indulge in many activities that are somewhat human-like. For example, not only do mound-building termites create the largest nests of any animal, but these mounds are air conditioned. Humans are still trying to figure out the complicated architectural design that allows termite mounds to be air conditioned, but we are getting close. In other words, termites discovered a form of environmentally friendly air conditioning long before humans learned to copy them. In addition to green air conditioning, fungus-farming termites practice a form of pest control that successfully prevents their crops from becoming infected with parasitic fungi. There exists very few animals that have mastered crop cultivation. Any animal that farms their own food, including humans, must practice some type of pest control method. Many mound-building termite species farm their own fungus, and keep their yields stored in particular rooms built within mounds. In order to survive off of the sustenance that fungal farms provide, some termite species, such as Odontotermes obesus, sniff out a particular type of parasitic fungus that infects the beneficial fungus cultivated by termites. The beneficial fungus cultivated by termites is known as “termitomyces,” while the weedy parasitic fungus is referred to as “Pseudoxylaria.” Pseudoxylaria grows easily within the oxygen-rich habitat that exists within termite mounds. In order to kill Pseudoxylaria, termites bury the parasitic fungus beneath the ground after sniffing out its location. Burying is an ideal method of pest control, as doing so prevents oxygen from reaching the Pseudoxylaria fungus. Researchers have discovered fungus-farming termites that use antifungal compounds to limit the spread of parasitic fungi, but the burying method was first discovered this year. It is possible that many, or possibly all, fungus-farming termites that bury parasitic fungi also make use of antifungal chemicals to protect their crops and stored yields. 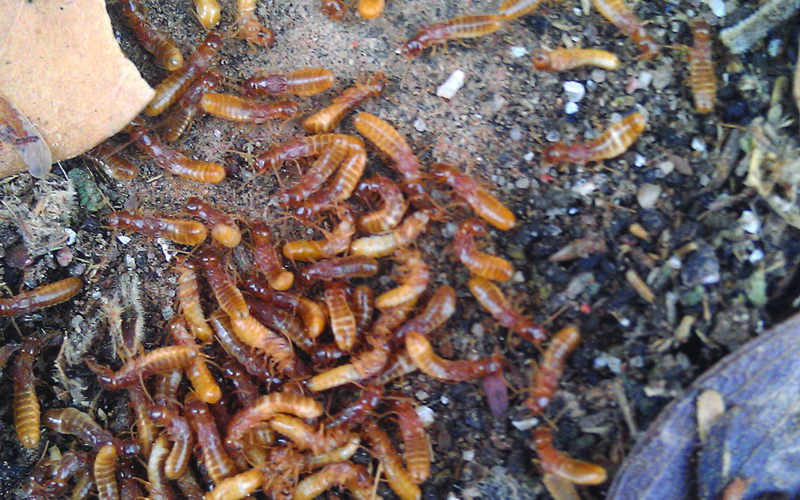 Do you think fungus-farming termites would not exist today unless they learned to bury parasitic forms of fungi? How Long Does It Take An Eastern Subterranean Termite To Take Form Within A Home?